Shelby Farms Park is a 4,500 acre urban park in Memphis, Tennessee. It has several lakes, paved and unpaved trails, open and wooded areas, a dog park, playgrounds, visitors and event centers, a restaurant, and many activities and events year-round. This makes it one of the best outdoor attractions in the Mid-South. The name comes from the fact that the area was once a farm that produced food for a penitentiary. After the penal farm ceased operations in 1965, citizen rallied to keep the land from being developed. Today, it is one of the largest urban parks in America and receives approximately 1,000,000 visitors each year. Shelby Farms is located in the eastern part of Memphis near Cordova. It is roughly bordered by Mullins Station Road to the north, Germantown Parkway to the east, Walnut Grove Road to the south, and Farm Road to the west. Click here for a map of the park. Shelby Farms boasts numerous bodies of water, boat rentals (including paddle boards, canoes, kayaks, and pedal boats), paved and primitive trails, a disc golf course, horse stables, a dog park, a playground, nature areas, Go Ape Adventure ropes course, a performance space, visitor's center, learning garden, indoor and outdoor rental spaces, and much more. Shelby Farms hosts many celebrations and events annually. A few of the major ones include an Earth Day, Dog-A-Roo Festival, Star Spangled Celebration, MEMPHO Music Festival, and Starry Nights during the holidays. Most events are affordably priced and/or free for members, though some may charge $5 for parking. Starry Nights is $20 per car and more for vans and limos. MEMPHO Music Festival is another exception that will be priced by the festival organizers. Agricenter International is located on 1,000 acres of the Shelby Farms land. It is designed to bring agricultural and environmental awareness to the public. The Agricenter features these elements: the Expo Center, the Show Place Arena, Catch'em Lake, the Farmers' Market, an RV park, and a farm for crop research and testing. In addition, the Agricenter hosts annual events such as a corn maze in October, a sunflower field, and pick-your-own strawberries in late spring. 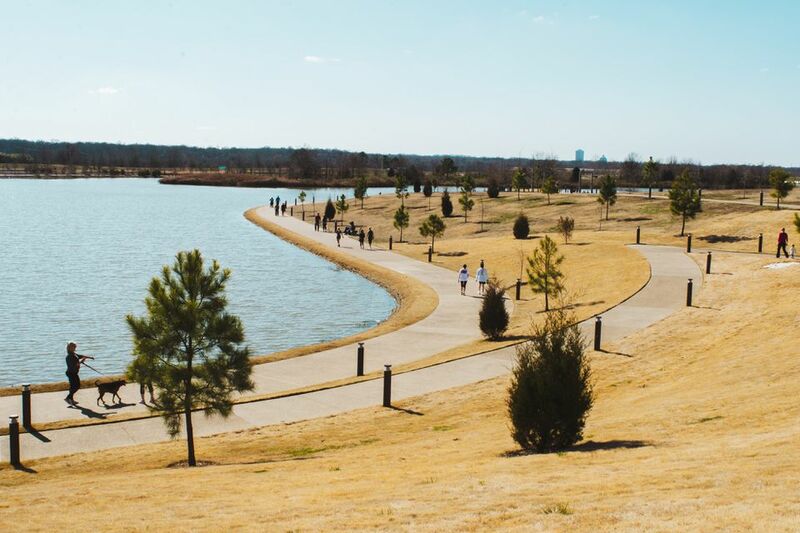 In 2015 and 2016, Shelby Farms underwent a $52 million renovation that included construction of a new visitors center, an event center that includes The Kitchen restaurant, a boat house, a performance stage, a renovated and ecologically responsible lake, and other improvements. Shelby Farms is open every day from sunrise until sunset. No swimming, hunting, ATVs, firearms, alcoholic beverages, signs, or tree/floral removal of any kind is allowed. Boats are only allowed in designated areas. Boating is only allowed in designated areas. A Tennessee fishing license is required for people over 13 years old. Shelters may be used on first-come, first-served basis unless previously reserved. Signs are not allowed unless by special arrangement. Dogs must be on leash except in the designated off-leash area ("the outback"). Music must not be played loud enough to be heard outside a vehicle, and you can't bring your own grill. The speed limit is 20 mph and you cannot park on the grass.